The Wood Manufacturing Council is a non-profit corporation that works to bring together stakeholders in advanced wood processing to help collectively address human resource and skills development issues in the sector. As the former sector council for the advanced wood manufacturing industry, we work for you. Since 2002, the Wood Manufacturing Council (WMC) has collaborated with employers, workers, educators, professional associations and government to help implement human resources solutions that will ensure the success of the advanced wood manufacturing sector. The Council’s mandate is to plan, develop and implement human resources strategies that support the long-term growth and competitiveness of Canada’s advanced wood products manufacturing industry and meet the developmental needs of its workforce. The Council identifies and examines the necessary skills and knowledge required to respond to changing industry needs. The Council also develops information and products to address key issues such as the shortage of skilled workers and the need for national standards for worker competencies. The Wood Manufacturing Council develops labour market information to help support the sector. These reports provide information on major needs and issues facing the sector, including economic factors that shape skills and labour supply and demand, the effects of skills and labour shortages, the occupations and skills that businesses need to meet their workforce needs, and strategies that stakeholders can use to develop and sustain a strong and successful workforce. The advanced wood manufacturing sector is a major contributor to Canada’s economy. It’s at the cutting edge of technology, using the latest practices and equipment to ensure efficient production that helps the sector—and the environment—thrive. Advanced engineering creates wood products from fast-growing species, and produces high-strength products from smaller trees. At the same time, the industry is able to use more of each log harvested, which means more products with less waste. A wide range of small and large businesses comprises the industry, including global brand-name companies with “household” recognition.Nonetheless, small shops and medium sized shops—employing 49 people or less—are the ‘heart’ of Canada’s advanced wood processing sector, accounting for approximately 68% of all sector businesses, according to our 2016 Labour Market Study. In the 15 plus years since our inception, the WMC has championed and managed approximately 50 projects related to Human Resources, skills development and training for the advanced wood products processing sector. These were done both in partnership with and/or on behalf of a variety of private and public sector partners. These projects have included the production of assessment tools, the development of career information and awareness materials, the creation of a range of training programs, the production of various labour market information studies etc. In almost every case, these projects were overseen by committees of sector stakeholders, including representatives of wood products manufacturers, relevant post-secondary educational institutions, trade associations, employees and employee groups, non-governmental organizations, and governments. The projects were based on needs identified through our labour market information studies. It is now over 15 years since a group of committed industry champions established the Wood Manufacturing Council as the national sector council for the advanced wood processing sector, an organization aimed at addressing the long-term HR issues being faced by those in the wood manufacturing industry. What a great privilege to be involved with interested and committed people from our industry (company reps, association staff and educators) to develop solutions for the HR challenges identified by the research we undertook. We collectively established an organization with a unique opportunity to contribute and we were determined to make sure that industry received the support they needed. A great deal of effort continues to be invested in speaking with companies so we can identify issues where we can offer solutions, support, and benefit to their business. We have published several Labour Market Information (LMI) reports over the last 15 years, to formally document challenges and to qualify and quantify the HR issues of the sector, so we might understand industry priorities, issues and solutions. Inherently, the industry knew what they needed, but having documented research allows us to make a strong case to access support for developing solutions. Our most recent study, ‘Advancing Wood Manufacturing in Canada – Canada’s Advanced Wood Manufacturing Sector: 2015-2016 Labour Market Information Update’ was prepared by The Conference Board of Canada. Building upon our findings, we began to focus on transforming this data into tools that companies could use to their advantage. Industry would need our support to research solutions for training, assessments, career promotion and awareness etc. Uniquely positioned to work in this area, as one of Canada’s Sector Councils, WMC devoted it’s time to developing the necessary HR tools, programs and solutions that could be easily accessed by all companies, small to large. We made these tools economical so that companies could benefit from them, while keeping their costs down and remaining focused on their business activities. We now offer an extensive suite of HR related tools that are proving to be assets for companies in their daily HR needs, and for their long-term growth. The WMC has come up with such items as Prior Learning Assessment & Recognition Tool, Rapid Internal Skills Enhancement program, the On-Line Management Training Program, Essential Skills Assessments and our Going Global program to provide wood-based international trades training skills development. WMC, recognizing the importance of partnering industry with education, several years ago assumed ownership of a high school curriculum program called WOODLINKS, which initially was developed in response to the needs of industry and secondary school educators. Recognizing the potential this course has in introducing students to the industry and at the same time providing wood manufacturing companies with skilled entry-level workers, WMC was honored to be able to continue the efforts of the WoodLINKS Society in BC and its supporters, who initially developed the program. Because of our national mandate, we were able to offer the program nationally. We have met with school boards, ministries of education, and high school teachers to promote the program and have expanded the curriculum to include sub-sector modules. The WMC has also been active in offering teachers opportunities to learn about our industry. While implementing WOODLINKS, WMC noted that there was also a need for a pre-employment program. The LMI also supported the fact that the additional employees our sector would need (in good economic times) could be recruited from various equity groups. Determined to offer opportunity to all Canadians, WMC established a program called WERC (Wood Employment Readiness Curriculum). This program was designed to train individuals for entry-level occupations in advanced wood manufacturing. There was initially a focus on First Nations, new immigrants and persons with disabilities etc., and we have undertaken programs specifically for those audiences and for women in non-traditional trades. We now offer WERC training to all interested parties (participant eligibility criteria may differ for each offering). The WERC program combines wood manufacturing skills, Essential Skills and basic life skill training and most often includes a job placement or work experience component. It serves a useful place in the spectrum of employer needs. We are happy to say that many of the graduates of the program have now been placed in full-time positions with wood sector companies. Firms that have used our tools and programs have told us they are helping with their HR efforts. I look back at the past 15 years and I am proud of what we, the sector, have accomplished. We have a wide range of solutions that address many of those challenges identified in the LMI. I thank those who were at the forefront, our founders and Board members over the years, and our project managers, some of whom have come and gone but who contributed to the useful tools that live on. I am very thankful to our many Steering Committee members – volunteers from industry, government, education and other groups. Their extensive volunteer commitment, their advice and their input was instrumental in developing relevant products. In reality, we did not have any great difficulty finding representatives to serve, as people are proud of their industries, and saw the opportunity to address a need. The WMC really provides a vehicle by which they can give back, help companies and workers succeed and support the sector as a whole. WMC serves as a national forum to address these issues. We ensured we were working with companies and stakeholders of all sizes from all across Canada, and we brought them together to develop solutions that they could take back to their own regions and constituents to provide value. We knew we had common issues, and it was our good fortune to be able to say to talented and committed people “come and help us develop good materials and products so they can benefit the whole industry”. As we look towards the future, there is much more to come. More companies will benefit from the existing products and services and we will look to the LMI for opportunities to expand what we do to assist the advanced wood processing sector. The WMC has lots more to deliver in terms of value and support to the skills, training and HR needs of our industry. This was what the Wood Manufacturing Council was created to do. While much has changed over 15 years, the WMC looks forward to supporting the sector with their skills development and HR needs and continuing to develop tools and programs to help companies achieve longevity and success. The Wood Manufacturing Council has had a unique blend of both public and private funding since our inception in 2002. 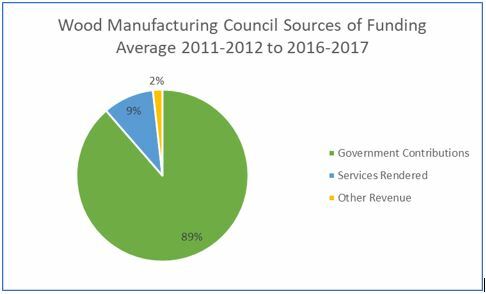 The majority of funding has come from the Government of Canada’s Sector Council Program, following our establishment as the national human resources sector council for the advanced wood products processing sector. WMC has also managed projects and provided services to Provincial Governments and other Federal Government departments. In addition, WMC has received support from industry in the form of contributions, donations and fees for our products and services, and we have undertaken some direct fee for service arrangements. Advanced wood product processing sector stakeholders – representatives from industry employers, employee groups, associations, governments and educators – have over time, made a tremendously substantial “in-kind” contribution in terms of time, products and services towards the development and implementation of WMC programs and services. We thank them for their expertise, their time and their interest. A heartfelt thank you to the following companies for allowing us to come into their shops and photograph their people and products for our website and print materials. Owner, C2 Custom Furnishings Inc.